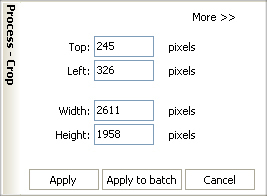 Use the Crop option to crop images/photos from the top, from the left side, or to the specified width and height. Click Apply you want to apply changes to one file. If you don't like effect, use CTRL+Z combination or Edit -> Undo from the menu bar to move back to the original image.